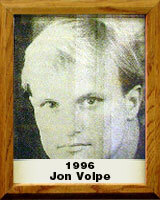 Jon Volpe grew up in Tucson, beginning his athletic career at age 7 with Tucson Youth Football. At age 10 he went to Tempe to see his first big game, Amphitheater High School’s state championship. What he remembers most was sneaking into the locker room after the game and, along with the players, singing Queen’s “We Are The Champions.” At that point Jon made it his life’s dream to one day sing that song after winning a championship for his mentor, Coach Vern Friedli. Later as an Amphi Panther himself (graduated 1986), Jon was both an academic and athletic standout – a National Honors Society student who also holds the all-time weight lifting record for total of all lifts combined. His wrestling stats along were remarkable. In football, Jon chalked up an incredible batch of awards, records and championships, including a high school record of 10-0 in regular-season play. In 1989 the Arizona Daily Star named Jon one of the top three athletes of the ‘80s, along with Michael Bates and Rodney Peete. At Stanford on a football scholarship, Jon again proved his prowess on and off the playing field with four awards in all-Pac-10 Academics, a Rhodes Scholar nominee, B.A. and M.A. degrees in Industrial Engineering, all while performing as first-team all-Pac-10 running back; becoming the third back in school history to rush for over 1,000 yards; scoring the single-game rushing record (220 yards); and being selected to Stanford’s All-Century team.